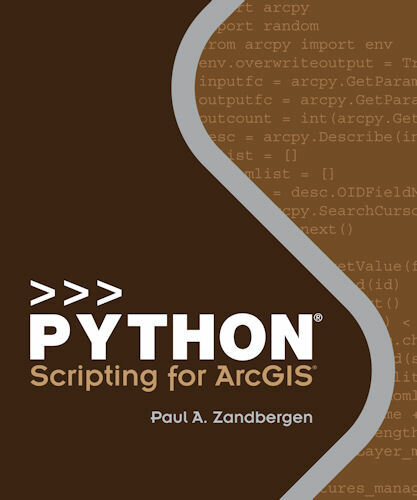 This week I noticed Esri Press released a new book titled Python Scripting for ArcGIS. I mean that’s a bit above the normal price for professional GIS book (which run about $60) and of course much more above general python books, which run about free. But let’s not get too tied down on the price. I mean if your career depends on using ArcGIS and you want to learn Python, $80 shouldn’t be an impediment to making yourself more desirable. Ah, but don’t fear. I Amazon has Python Scripting for ArcGIS at a much more reasonable $50. Plus Amazon has the first chapter available for review so you can see if it will work for you. If you’re interested in the author, his University webpage gives a little bit of background. I don’t have the book so I can’t give a recommendation yet. It is still preorder so I guess we’re going to have to wait a bit, but to save $30, why not? If people get the book, let me know how it is and I’ll make sure to share it with everyone else.